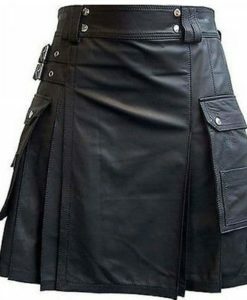 Kilts for Men by Kilt and Jacks include all the type of Mens Kilts including Utility Kilts, Scottish Clan Tartan Kilts, Leather Kilts, Hybrid Kilts, Gothic Kilts, Warrior Kilts, and Tartan Utility Kilts. 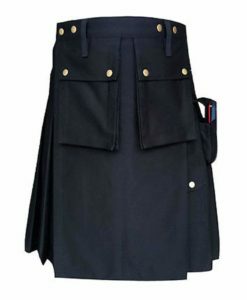 All the Kilts can be worn on casual as well as formal location as per the need of wearer. 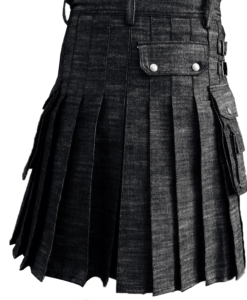 Highly skilled and Trained Kilt makers craft each and every Kilt with love and Passion for the community. Our Aim is to provide premium quality Kilts in the lowest rates possible. All the kilts receive equal attention from our Kilt makers and handlers since each and every customer is important to us. We want to make their experience amazing and memorable with us. Please Note: All the Kilts are purely handmade using high quality fabrics. It takes us 10 Days to manufacture, handle and Ship the Kilt to our customers. 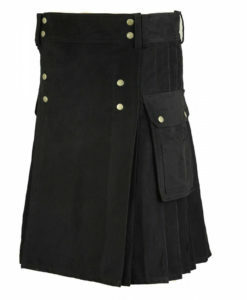 We are the fastest hand-made kilt manufacturer in the market and we do not charge extra amount for our fast service. 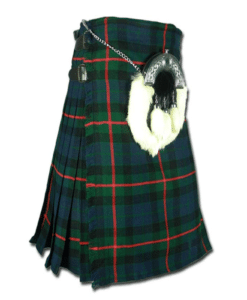 All the kilts listed under this category are handmade using high quality premium fabrics. Our makers put their 100% to create and manufacture a best-fit Men's Kilt for the customers. 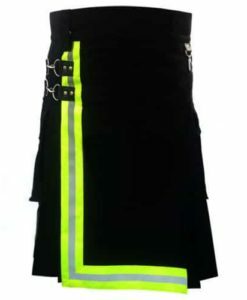 It is our priority to provide utmost customer satisfaction and best quality custom kilts to customers. 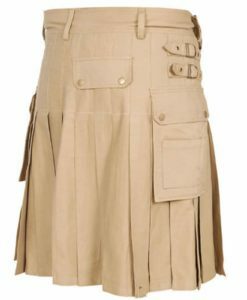 Kilt and Jacks usually does not hold any inventory of pre-made products as we manufacture fresh Scottish Kilts for Men as soon as the order is received based on the given instructions of the customer. 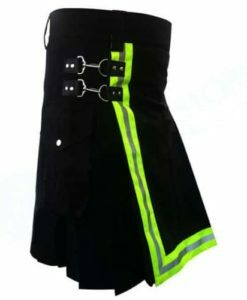 All the provided information about Kilt is taken into consideration and manufactured accordingly. 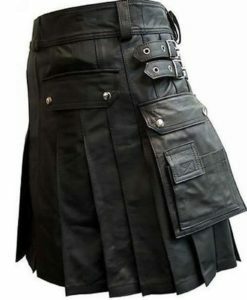 All the provided information is precisely used and taken into account while making a custom kilt for our customers. 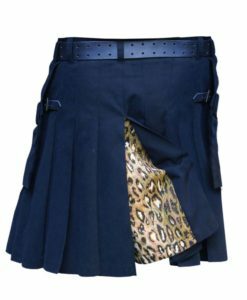 Kilt and Jacks has made custom kilt making very reasonable for many of the kilt lovers out there. 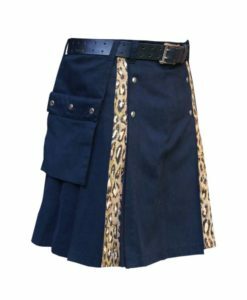 Being custom Kilt maker, We are always being questioned that how do we manage to manufacture and ship high quality custom kilts in such a record time? The simple answer to this is "We have highly Efficient and reliable team". Our people work really hard to enhance the experience of Kilt wearers. There are more than 50 people working day and night to provide high quality service to the customers of Kilt and Jacks. Each of our Kilt maker goes through a detailed training of Kilt making to manufacture a best-fit and high quality kilt for the customers. We have created a blend of Scottish techniques and modern technology to help the Kilt wearers in many ways. 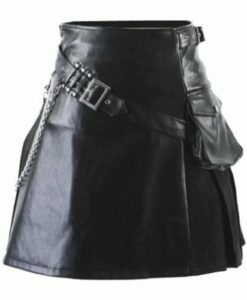 We keep our Kilt makers informed about the techniques and Skills that are being used and applied by the traditional kilt maker without losing the essence of traditional Kilt. 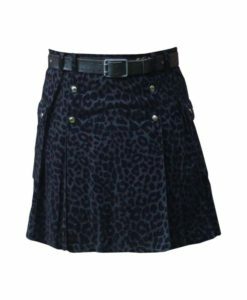 We have team of 2 to 3 people who are dedicated to select high quality fabrics and bring that in for making custom kilt for the customers. We only use premium quality fabrics which is durable and really appealing. Kilt and Jacks try its level best to make your experience amazing and memorable. 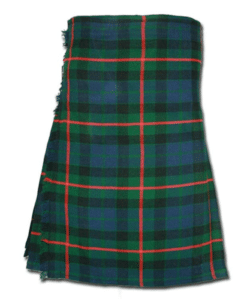 There are various type of Fabric used for various Kilts. 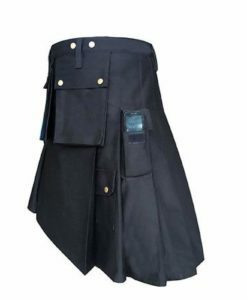 Like normally Utility Kilts are made up of 100% Cotton fabrics, Denim Kilts are made up of Denim fabric, Hybrid are made of Cotton and Tartan (100% Wool or Polyviscose.) and Leather are made up of 100% Genuine leather (Lambskin, Buffalo, Sheep and other). 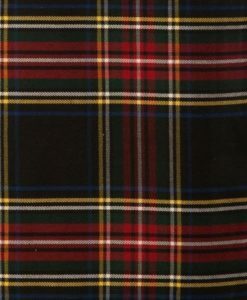 Whereas the Tartan kilts are normally made up of Polyviscose; however, on special request we manufacture Tartan kilts in 100% Wool as well. For manufacturing tartan kilt in100% wool, customer has to contact the support first. Talking more about Tartan Kilts, so these Kilts are available in 2 fabric quantity styles like; 6 yards fabrics and 8 Yards fabrics. 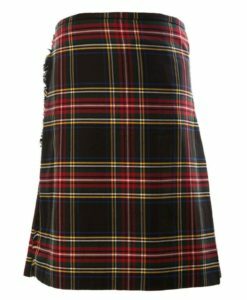 Normally, we manufacture Tartan kilt in 6 yards fabrics, but if customer demand for 8 yards then we manufacture that as well. 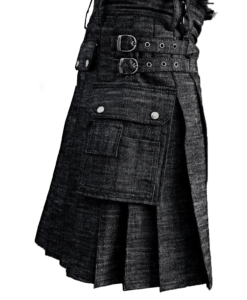 Kilt has a long and rich history which was worn in Scotland for so many years. 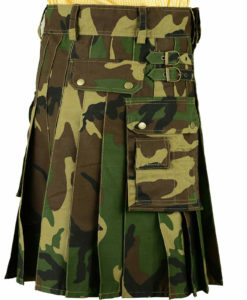 Kilt for Men includes a great kilt, which is a long piece of cloth which was hand pleated and wrapped around the wearer. 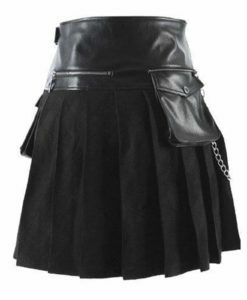 These types of Kilts are still being worn for fun and some wear it on special occasions like; theme weddings, Renaissance fairs, LARP, SCA, historical reenactments, etc. The Kilts which are worn nowadays are kind of "Short kilts" (or "little wrap", Gaelic: Feileadh beag) which was originated in the late 18th century and was perfected by the Victorians in the 19th century. Short KIlts are properly tailored cloth where pleats are sewn in and Fabric is shaped, sewn and reinforced using durable garment. 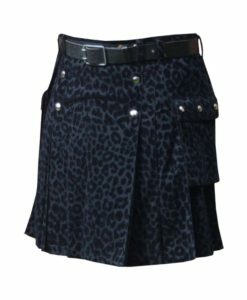 The Utility Kilts are modern-day kilts which are made up of 100% cotton fabrics and pleats and fabrics are properly sewn. 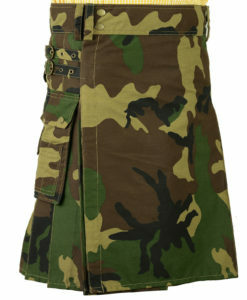 Seeing the modernday demand, Utility kilts come up with Cargo pockets as well.